****Updated**** Gave it a little face lift, added some more cute clip art, added a few more activity pages (look at preview). 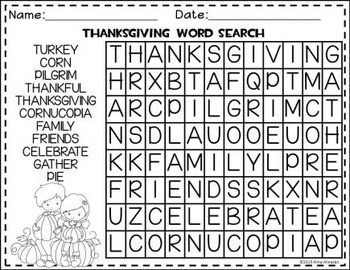 I Spy A Ten-Frame-November (0-20) 4 large cards & 12 Student response pages---November pack includes number word practice. 2- Sets of Roll, Say, Color (18 words from the Fry's First 100)-for, that, are, on, with, as, they, can, have, at, be, this, from, his, had, not, look, & my. Comes with 3 large cards and in black and white. Second set-Roll Say Color- words practiced are I, like, the, and, a, is, see, to, it, in, of, you, will, we, go, he, she, and was. "How Do You Use Your Senses" Little Interactive Reader about 5 senses and pumpkin pie (yummy). Roll-a-Turkey-Roll a die and draw a turkey by parts. Turkey Sums- Roll 2 dice. Add dots. 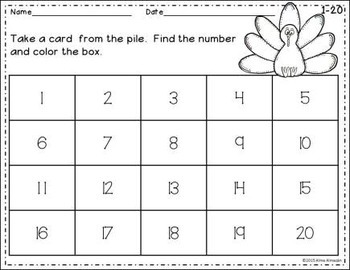 Color turkey with that number. 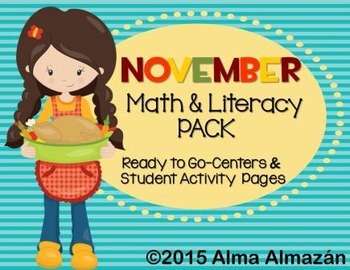 All activities come with Student Response pages. Please make sure to take a look at the preview to see exactly what comes in this bundle.